It might be a surprise to some but Chamonix is not all about the extreme sports, epic day hikes and elite endurance events that it first appears. You don’t have to base jump off the Aiguille du Midi to have a good time. Obviously it accommodates the interests of keen endurance enthusiasts and adrenaline junkies but you do not have to partake in such activities to enjoy the outdoors and the spoils that Chamonix and its associated valley has to offer! So the typical touristy thing to do in Chamonix when seeing the sights…. and to be honest it’s easy to see why, is to get the cable car up to the Aiguille du Midi. It’s Chamonix’s tallest lift going from the Valley floor at just over 1100m to the dizzying heights of 3,842m upon Mont Blanc, just 1000m shy of the tallest summit in Europe. From there you can ‘Step into the Void’ if you’re brave enough or simply take in the breathtaking views of the French, Italian and Swiss Alps… and of course the Mont Blanc Massif itself. As well as the views to can get educated in Chamonix history, have a bite to eat, or even go shopping. It’s a Chamonix must and you can also explore the beautiful scenery at the Plan de Aiguille Mid station also. As well as the Aiguille du Midi there are plenty of other wonderful sites to visit including the Mer de Glace Train up to Montenvers to witness France’s longest glacier, perhaps to visit the mesmerizing ice caves carved into the glacier, however this will now involve 400+ steps due to glacial recession. For the best panoramic views of the Mont Blanc Massif why not jump on the Brevent Cable car, normally on the sunny side of the mountain with its southern aspect where you can get your postcard picture snap to spruce up your facebook profile or Instagram feed! REMEMBER to take your camera!!! Treat yourself to the indulgent splendor of a Spa day. In Chamonix you are spoilt for choice with an extensive number of 4 & 5 star hotels featuring top of the range spa facilities. Whether you prefer the rooftop hot tub of the Park Hotel Suisse & Spa, the 5-star extravagance of the Hôtel l’Héliopic or the relaxed refreshing atmosphere and treatments at the Les Aiglons there is something to suit all. For those that would like the opportunity to visit a natural thermal spa you are a short drive away from the natural thermal Mont Blanc Baths in Saint-Gervais-Les-Bains (15-mins) and Italy’s Pre St Didier Spa (40-mins). Check out our Best Spa Breaks Guide here. Chamonix centre itself is well known for its good food. You are not short for choice when it comes to excellent cuisine, especially in one of the many Michelin starred restaurants such as L’Atmosphere and the Albert Premier. You could easily spend a whole week just sampling all the various ‘foodie’ hot spots in and around Chamonix and not get bored. A local macaroon delicacy accompanied by coffee for brunch, followed by a hearty Savoyard lunch, topped off with a mouth watering feast come evening. The only very slight limiting factor is that you will find most restaurants will commonly serve local Savoyard specialities generally involving potatoes, cured meats and CHEESE, usually all three together! However that said there are some great alternative options to choose from if you know where to look. Check out our Best Chamonix Restaurants Guide and Mountain Restaurants Guide. Chamonix’s pedestrianised high street is full of variety when it comes to shopping and it’s a great day out in itself. Whether, you’re looking for that next outfit or merely window shopping for the ‘if i won the lottery’ items it has it all. There are beautiful craft shops, designer boutiques, regional produce, outdoor brands and sports shops. A big bonus is there is never a cafe or patisserie far away if a quick refuelling pit stop is required. Obviously, weather dependent but come the summer Chamonix can have glorious weather. There are a number of local lakes, streams and ponds to choose from to go have a relaxing paddle or soak in some well needed vitamin D. Lac de Passy just 15-minutes drive away is set beautifully with Mont Blanc as its backdrop surrounded by a beautiful beach and green grass, plus a number of shady spots beneath the trees. There are a number of activities for all to do as well as the expected swimming and sand castles, including a high ropes acro park, fitness circuit (yes i know I said no exercise) paddle boarding, and kayaking. Closer to home you can find Le Paradis des Praz near the golf course where you will find the soothing sounds of the gently flowing stream and shallow clear water ponds for the children to play safely in. The accompanying natural play park will entertain the little ones while you relax watching from the comfort of your picnic blanket or a table nearby. Chamonix is stooped in History particularly in the Alpine world including the story of the first men to summit Mont Blanc, whom the main streets of Chamonix are named after. Why not take time to visit the Alpine Museum, the famous Saint Bernard Farm (Elevage de Saint Bernard), or one of the many exhibits or art galleries to often feature in the town centre. At Montenver there is also a small Crystal museum. There are many historical church landmarks including the beautiful Baroque church in Saint-Nicolas de Véroce. If you have little ones jump aboard the Le Petit Train for a quick history tour of Chamonix. There are are number of parks a short bus ride away or accessed easily from the lifts within the Chamonix valley. The closest of which is the Parc de Loisirs in Les Planards which has its own mini fairground rides, including the infamous Luge. Parc Merlet is a must for the animal lovers and wildlife appreciators amongst you where you can get up close to nature in its wildest form on a nature reserve. More information can be found here. Chamonix is renowned for its world class events and apres scene in the winter. It can’t be beaten for choice of live entertainment in both the winter and summer season. Come summer you have the notorious Cosmo Jazz festival where a diverse range of artists from around the world perform in a number of spectacular locations from mountain summits during the day to the valley floor of an evening. Throughout the year you can find live performances around Chamonix most days, notable of which can be found at the rather chic Maison des Artistes. Chamonix has more bars, restaurants and nightclubs than you could possibly explore in a season…. let alone a week or fortnight holiday. It would be rude not to sample a selection of the finest watering holes in Chamonix so take a look at our guide to Chamonix’s Best Bars and Clubs here. Okay, this might sounds slightly ridiculous at first but we assure you it’s not. In fact for those wanting a more relaxed day then there is no better way to discover the epic scenery that France and Switzerland have to offer. The Mont Blanc Express runs all the way from St Gervais to the Swiss town of Martigny. The delightful iconic red and white mountain train undulates its way over the mountain cols through the valley to reach Switzerland. It’s a fantastic day out and well recommended. If you would rather go high or on the original historical Mont Blanc Railway then you should definitely take a ride on the Tramway du Mont Blanc. The historical railway is the highest in France and the fourth highest in Europe dating back to 1907. From St Gervais you can take the tramway up to the Nid d’Aigle upon the Mont Blanc Massif with exceptional views of the Bionnassay glacier and Mont Blanc itself. Pretty self explanatory, but the French alps being the birthplace of paragliding as we know it today it offers so much more. Unparalleled views of the mountains and glaciers during a tranquil flight or an adrenaline fuelled spinning acrobatic freestyle tandem, you decide. 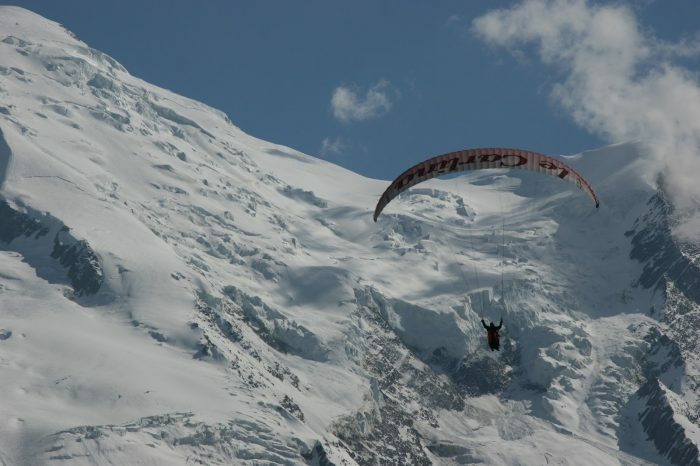 For more information about the various tandem flights available check out our Chamonix Paragliding article here. And no we don’t mean the small supermarket chain. We are thinking get lucky on the slot machines or take on the croupier’s at the Blackjack table. The Vox cinema in Chamonix centre plays a mixture of French and English films every day. Not only mainstream blockbusters are featured here but a vast number of local feature and short films also. So whether it’s a plan for a rainy day, an evening of light entertainment, or simply to relax you can find out what’s showing here. In Chamonix Sud vicinity by the bus station you will find the local bowling alley. A great way to spend a relaxed evening playing in the arcade, hitting strikes (or not in my case) and socialising with friends and family. This venue has a wonderfully relaxed atmosphere, allowing you to bring in pizza from the emporter over the road and a great selection at the bar…oh and bowling …obviously! If you fancy a change of scenery or a day out of the valley then there are many world renowned places of interest within easy reach of the Chamonix Valley. Just for starters these include the beautiful fairytale town of Annecy, the ‘Monaco of the Alps in Montreux, infamous Italian style and cuisine of Courmayeur or simply the ritzy sophistication of Geneva. You can find our day trip guides on our Peak Transfer Blog.